I gathered in this oversized cabinet card portrait of miller Raymond Lycurgus Kelly and Belva Grace Wiles Kelly because I knew they were life-long residents of Frederick County, Maryland. What has stumped me is the name of the Frederick photographer who took the photograph. The blind embossed mark was used in the early days of carte de visites by photographers such as the Bendann Brothers and Henry Pollock. After the great excesses of photographic advertising back-marks of the 1880s and 1890s, the blind emboss made a comeback as a tasteful, restrained style that comported with early 1900s tastes. But if an impression is not made deeply enough, such marks can be hard to read. One can make out “Frederick, Md.”and “Studio,” but the name of the studio or photographer, written in flowing script, is nigh impossible to decipher. One thing I could see was that the photographer’s name had to be short. My investigation started with research into the portrait’s subjects to get a sense of the time this photo might have been taken. 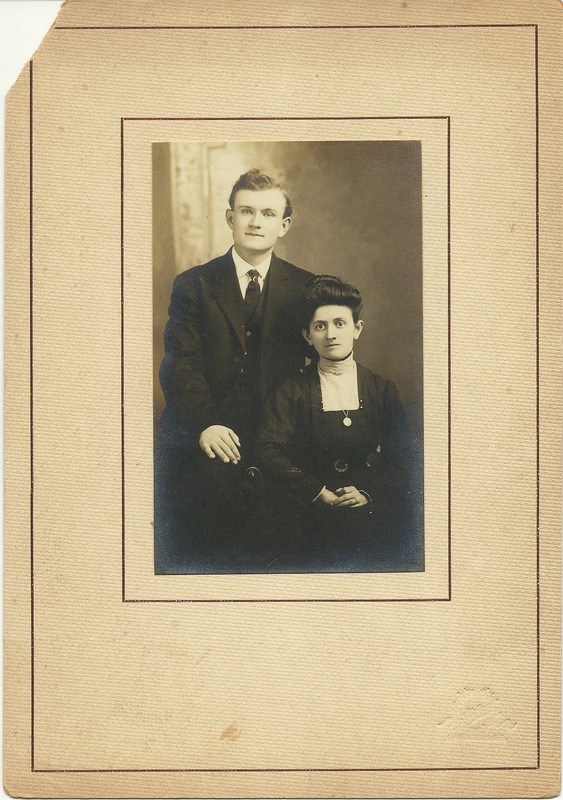 Popular miller and auction sales clerk Raymond Lycurgus Kelly (1890-1958) married Belva Grace Wiles (1887-1956), daughter of Sarah Hummer and Lewistown farmer Americus Wiles (1846-1905), about 1910-1911. After their marriage, Raymond and Belva lived in the Walkersville area, and were active in the Mount Pleasant United Methodist Church, just south of Walkersville. Raymond was just 21 when he married, and he certainly looks quite young in this photograph, so the photo could have been taken ca. 1910-1915. I ruled out the surnames Ridenour and Leidweidge as too long. My best guess is that the mark is that of John Frederick “Frank” Kreh (1861-1939). For 60 years, he did all sorts of photographic work, until his retirement in 1935–landscapes and historic sites for postcards, architectural and construction photos, photos of all sorts of events, as well as studio portraits. Chances are good that if you have family who lived in the Frederick area during the 20th century, you have a photo by Kreh in your album somewhere. Got an idea about the name of the photographer on this portrait? Let me know. Frederick Kreh is buried an unmarked grave in Mount Olivet Cemetery, Frederick, Md., next to his son, Leslie Kreh (1892-1903).